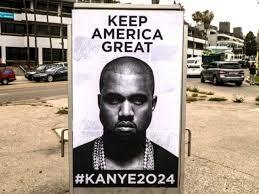 Kanye 2024 let’s keep politics for the people not the politicians. Mr. West has the business experience and unique political solutions that have even caught the eye of the current occupant of 1600 Pennyslvania Avenue and a history that touches many American’s hearts. He is willing to stand alone to try and create results that matter not resistance that helps only the few. Kanye 2024 because we need a leader that is willing to lead instead of just follow.